Multiquip offers a wide range of screeds to meet the needs of contractors. The compact, lightweight DuoScreed™ is ideal for small-medium size jobs and provides a tremendous value and rapid return on investment. Our range of Vibratory Truss Screeds provide the versatility to accommodate larger pour requirements and it's rugged design will provide years of productivity. 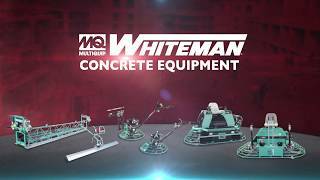 Watch this video to learn more about our MQ Whiteman walk-behind & ride-on trowels, our duoscreed and our steel vibratory truss screed. Versatile design adapts easily for either form-to-form or wet screeding applications. A durable extruded-aluminum alloy blade transmits vibration to the slab for effective consolidation. Highly maneuverable and functional, the DuoScreed is designed for jobs large and small. These are the ideal screeds for large projects. Contractors can strike off areas of up to 65 feet (19.5 meters) wide. The WSHE/MSHE Series offer an 11 HP Honda gasoline engine option. Rugged steel designs handle the rigors of any job site, provide durability and offer a long service life.